As you might know that Android has recently announced its latest Version of android named Android Oreo and the Version number is 8.0, with some new features and performance improvements, they are claiming that it will decrease the boot time and many more thing you will notice on the initial builds of this ROM. So today we are going to talk about How to Install or flash Android Oreo 8.0 on Redmi Note 4 running on Snapdragon 625 chip set, I would like to tell you that, this is an unofficial ROM developed by LineageOS, So There would be some bugs(or many) which you can notice easily, the ROM is LineageOS 15.0 Alpha ROM which we will be flashing today on a Redmi Note 4 Device. Some users are Reporting that VoLTE is not working properly and some are also reporting that fingerprint sensor is not working that great, and Bluetooth also not working, as this is an unofficial and very initial Alpha ROM you can expect many bugs, I will be updating the latest one as soon as I get from XDA developers, so the bugs would get fixed in some time. Always try to flash the latest build find it below. The bootloader Must Be unlocked and the device must have custom Recovery TWRP installed in addition to flash Android Oreo 8.0 ROM on Redmi Note 4. Now I am assuming that your device has an unlocked bootloader and installed custom TWRP recovery on your device so let's move further to flash Android Oreo ROM based on lineage OS 15.0. Now after Flashing completes, just go back once and click on install again to Flash the GApps (GApps are the Google Apps), just select the Gapps zip file and swipe right to flash it, it will also take upto 2 minutes, and after flashing GAPPS, now click on Wipe Cache/Dalvik and swipe to wipe. Now Go back and Boot your device into System, and it will start booting into LineageOS based on Android 8.0 Oreo, that’s it. 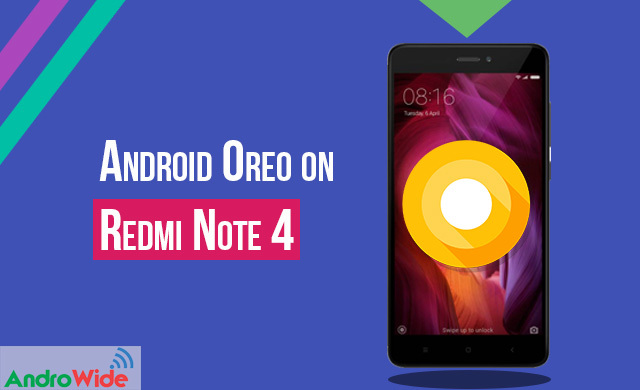 You have successfully installed Android Oreo 8.0 on Your Redmi Note 4. Please comment down below if you are facing any issues or any bugs.